Image credit Jedrek B via Flickr (CC). On April 11th after five days of sustained protests outside of the compound of the Military High Command in Central Khartoum, the Minister of Defense and First Vice President of Sudan, Ahmed Awad Ibn Auf made a televised broadcast to the nation, announcing the arrest of President Omar El-Bashir and an unspecified number of other high ranking officials primarily associated with Islamist Movement. Ibn Auf declared the military’s intention to form a transitional government, the makeup of which would be announced later, and a three month state of emergency including a curfew. His demands have been rejected by the Sudanese Professional Association and other groups like Girfna, which have declared that only a civilian transitional government would be acceptable. The Sudanese Professional Association have published a Declaration of Freedom and Change which outlines a plan for a four year transitional government made up of civilian technocrats. Chants of tsgut bas (Just fall) changed overnight to sgut (fallen). 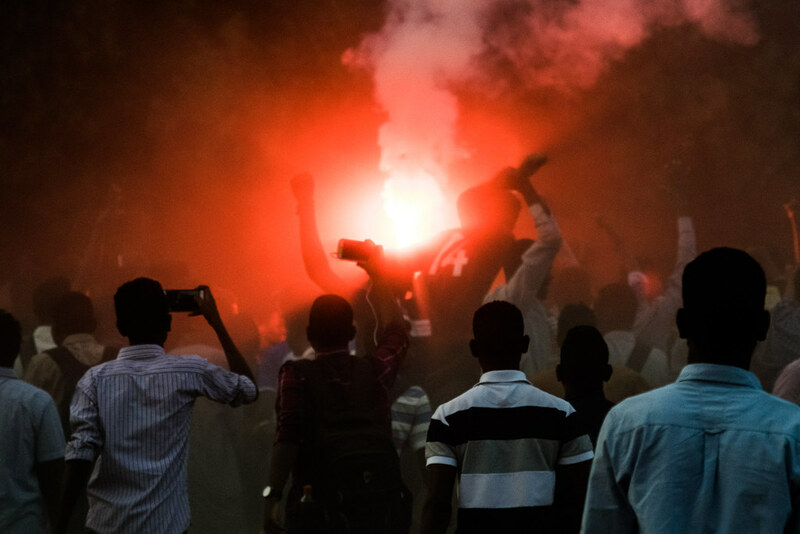 The Central Committee of Sudan Doctors estimated that during the last five days at least 21 people have been killed in the protests with at least five of those coming from the military and two from the security services. Chanting that the military and the people are one, the Sudanese crowd succeeded in revealing fault lines within the military and security services as a number of officers and soldiers defended the right of the protesters to demonstrate, even as their senior commanders reaffirm their loyalty to the Presidency of Omar El-Bashir. In the process, there were a number of clashes between the regime’s paramilitary forces such as the Rapid Support Forces and the militias organized by the National Intelligence and Security Services and regular military units and police. Ibn Auf in his morning statement explicitly referred to the possibility of clashes within the security sector as being one of his main impetuses in carrying out the coup. He explicitly stated that the military high command spoke with the former President Omar el-Bashir and informed him that the military could not disperse the protestors without a massacre, only to have Bashir suggest that the protestors should be crushed. The scale and persistence of the most recent protests in Sudan seem to have caught the government off guard, the decision in late February to replace all 18 of Sudan’s governors with military officers, clearly demonstrates that the regime has been preparing itself to preserve the loyalty of the armed forces in the face of a crisis that has only escalated since demonstrations began in mid-December over the rapid increase in the price of bread. Yet, the demonstrations revealed that the mid-ranking officers and rank and file of the armed forces, as well as the Rapid Support Forces and police were unwilling to obey orders to commit massacres in Khartoum. It was the brewing rebellion within security sector in Sudan that forced Ibn Auf’s hand. 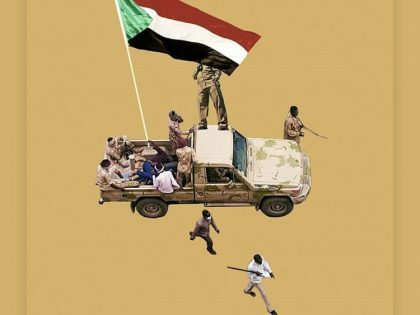 While the grievances of the Sudanese people, demonstrating in the streets against the thirty year presidency of Omar El-Bashir, who has declared his intentions to run again in 2020, go far beyond the merely economic, to encompass vast corruption, political repression and endless war, the worsening economic situation in the country is in many ways ironic. In the wake of the partition of the country into Sudan and South Sudan in 2011 and the loss of upwards of 75% of Sudan’s petroleum reserves the regime in Khartoum intensified its policy of trying to improve its relationship with both the United States and its regional allies particularly the Gulf Countries of Saudi Arabia, the United Arab Emirates and Qatar. 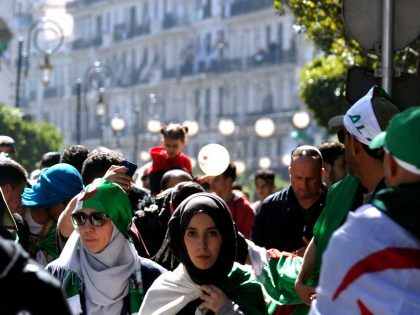 These policies appeared to bear fruit in recent years not only with large investments from the Gulf Countries in the agricultural sector and the transfer of hard currency to the Central Bank, culminating in 2017 with the partial lifting of sanctions imposed by the United States on the country. Citing improved counter-terrorism cooperation, last year the United States lifted its trade embargo, a freeze on some government assets, and restrictions on Sudanese banks to access international financial markets as well as foreign banks to do business with Sudan. In November 2018, US and Sudanese authorities began talks to remove Sudan from the US list of state sponsors of terror, which it was added to in 1993, merely four years after Bashir’s regime came to power. However, paradoxically, the improvement of relations between Sudan and the United States as well as its Gulf allies has not lead to an improvement in the Sudanese economy. On the contrary, the Sudanese currency began to precipitously decline starting in 2017 as sanctions were removed and it has now plummeted from roughly 8 to almost 50 to the dollar using official exchange rates, and far lower on the black market. Last summer inflation in Sudan consistently ran over 60 percent. Though the government attempted to address the situation by devaluing the currency in October 2018, it has not been able to control inflation, and has resorted to extraordinary measures such as limiting the supply of the Sudanese pound, resulting in long lines at banks where depositors are forced to stand in line for hours, unsure if they will be able to withdraw their savings. The protests in December of last year did not come out of the blue. 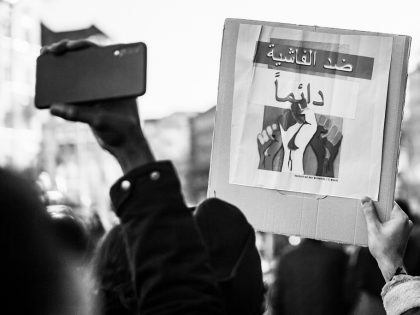 Large-scale protests broke out in Sudan in January 2018 protesting the rising price of petrol, medicine and staple goods, and continued sporadically throughout the year. During the traditional Eid al-Adha feast in August of last year, there were severe bread shortages throughout the country and as protests began to spread in areas like Gezira province, President Omar el-Bashir was reported to have said upon seeing the long lines of Sudanese stretched out in front of small bakeries along the Khartoum to Wad-Medani road that no one had told him there was a shortage of bread in the country and that he would have his ministers sort it out immediately. Yet perhaps the most revealing comments came last August when the CEO of the DAL Group, Osama Daoud Abdel Latif, whose firm is the biggest importer and miller of wheat in the country, said that “ it is the government’s job to feed the people, and it is his firm’s job to make a profit,” in response to government accusations that his firm’s decision to reduce its imports of wheat was behind the scarcity of bread in the market according to the local press. The background to the dispute was the loss of value of the Sudanese pound in relation to the US dollar and the Government of Sudan’s attempt to end the DAL Group’s ability to buy US dollars at a special rate from the Sudanese Central Bank. Today despite Sudan’s vast agricultural lands, some estimate the quantity of Sudan’s arable lands at upwards of 200 million acres (though these numbers should be taken with caution), Sudan imports an average of 2.7 million tons of wheat annually. Since the 1970s, wheat has been a staple of an increasingly urbanized Sudan’s diet. Wheat, which Osama Daoud affirms it is easier and cheaper for his firm to transport from Australia to Port Sudan, than from Port Sudan to Khartoum, must be paid for in dollars, dollars that are only becoming more and more expensive. One of the cruelest ironies of the al-Ingaz regime or National Salvation Front that came to power in 1989 was that while they spoke defiantly of embracing a national renewal of Sudan as an Arab-Islamic Civilization, and even at their most ambitious during the 1990s talked of remaking the international relations of the Middle East, they never developed a coherent economic policy. Instead, while elements of the regime during the 1990s sought to disrupt the United States led system of alliances spanning the Middle East from Egypt to Saudi Arabia and even Ethiopia, regime policymakers only deepened the country’s reliance on US dollars. Therefore as Sudan was increasingly sanctioned, making its access to dollars ever more expensive, it became more and more dependent on those dollars. In particular, agriculture was neglected in favor of petroleum which was sold in dollars on the international market. The agriculture sector that was developed continued to be geared towards exports instead of domestic consumption, so that huge amounts of wheat need to be imported each year, and the nascent dairy industry relies on imports of its basic elements including even cattle. Since partition in 2011, this dilemma has only increased as the government, desperate to raise hard currency, has sold off large tranches of land to foreign investors in exchange for one-time injections of dollars. The latest fad has been mining for gold. Sudan’s reintegration into global markets comes as at a huge price, as a story from December 2018 in the Financial Times makes clear. For Sudan to be able to access international credit markets once again, it will have to settle its more than US $50 billion debt to public and private creditors, who are already beginning to circle. Desperate to resolve its hard currency deficit, Sudanese politicians and policymakers are unlikely to be in a strong bargaining position. A first step however would be a Sudanese economic policy that prioritizes domestic production and consumption over the endless struggle to earn hard currency, a policy that has brought down one Sudanese government after another since independence.